Are you covered up in layers of sweaters and jackets even inside your home? Get the new cost and energy effecient Halogen Room Heater that will heat up your room in no time! I took up an internship in November 2014. 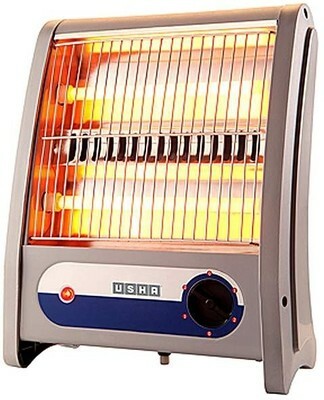 Of course I couldn’t bear more of the frozen feet and stinging cold and so I invested MY FIRST PAY in purchasing an Usha 3002-QH halogen room heater to keep MYSELF warm ALL along the season. I was surfing through Flipkart, assuming that a room heater would surely burn a huge hole in my pocket and that is EXACTLY when I came across this masterpiece. ALL it costed ME was a little over a thousand rupees and it arrived at MY door step with a user manual and ONE YEAR warranty card. I unpacked the parcel and noticed that the heater has a powder coated finish which makes it corrosion preventive. Also, it possesses a SAFETY tip-over switch and consumes MINIMAL electricity as the mentioned power consumption (maximum) is as low as 1200 watts. This low power consumption would certainly ensure that I don’t have to pay extensively bloated electricity BILLS. The product turned out to be remarkably efficient in terms of heating a medium sized bedroom. My ONLY complaint regarding this product is that it does not have an auto revolve feature and that as soon as it is plugged in- in a large sized room, the effectiveness drops down a bit. In totality, I would say that it sure is a good buy for those of you who don’t reside in king sized mansions. The halogen heater is ARTISTICALLY crafted and works very WELL if your purpose is to basically keep YOURSELF geared up and warm whilst the frosty winds try to make you shiver and give you CHILLS. To prevent fire or severe burns, keep ALL inflammable materials, paper, bedding, blankets and furniture at least 2-3 feet away from the electric heater. Before using your electric heater inspect it thoroughly to check if the heater is clean and in good condition. If you find any fault then get that problem professionally repaired. Place the electric heater out of high-traffic areas. Also keep it on a hard, non-flammable surface and not on carpets, wood/plastic furniture. Use the room heaters to provide supplemental heating and not for drying clothes or cook food. Do not allow pets or children near the electric heater to avoid any accidental contact, shock or burn. Do not overload the socket where the electric heater is plugged. Make sure that the unit is not plugged into the same power socket with other electrical appliance. Most importantly never leave the electric heater unattended. Avoid carbon mono-oxide poisoning by turning off the heater and unplug it before leaving room or going to bed. The Carbon mono-oxide poisoning can be very dangerous. Signs of carbon-monoxide exposure include headache, dizziness, abdominal pain or discomfort, nausea, vomiting, and weakness. There is no harm in being a little extravagant for family safety, so replace your older heater with a newer and safer one.